If you are looking for information on the Closet and Storage Concepts franchise business opportunity, Closet and Storage Concepts organization franchises or Closet and Storage Concepts franchising, then you have come to the right place. Closet & Storage Concepts is a home organization and storage products company headquartered in Southern New Jersey, just outside of Philadelphia. Founded in 1987, the company has enjoyed over a decade of growth, serving customers in every part of their home by designing, manufacturing and installing custom closet and storage organizing systems. When a customer calls our office, we offer an in-home, no obligation design consultation at no charge. During this visit in the customer's home, our designer will measure the closet or area in need of organization, show the customer photographs of products, and perform a wardrobe analysis. Using all of this information, the designer will create a plan for a closet or storage system which best serves the customer's needs and budget. Upon approval of the design, our fully equipped factory will custom manufacture the system out of furniture grade melamine laminate, which is available in dozens of finishes and colors. A company trained and employed installer will then deliver the system by van, and custom install it in the location. Our personnel are company employees, not sub-contractors, and all work is covered by a full lifetime warranty. Design options include such features as built-in drawers for socks and underwear, pull-out baskets for storage or laundry, jewelery drawers, belt and tie racks, shelf-dividers and much more! We can create a system to organize closets, pantries, garages, laundry rooms, home offices or any other area which needs help. 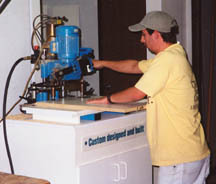 All units are completely custom designed and built, and all installations are custom. By expanding our successful concept through the opening of franchise owner operated locations, Closet & Storage Concepts is committed to providing storage and organizational products to customers across the United States. In 2003, over $100 billion will be spent in this country on home improvements. Be a part of this tremendous growth! 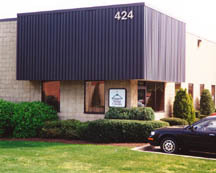 When our company started in 1987, all we did was closets. And we've done a lot of them. At last count, we've installed over 40,000 closet systems in our customers homes and offices. While we were there, we found other areas that needed organization just as badly. Places like garages, pantries, laundry rooms, basements and home offices. As our business has grown, so has our line of products and services for every part of the home.